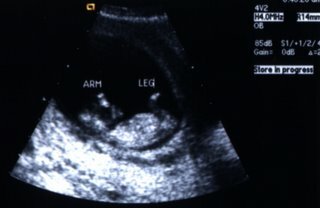 Baby #6 has a heartbeat and appears to resemble a baby. The days of husband attending ultrasound appointment and ooing and ahhing over the alien-like fetus are over. I have to go it alone with 5 young 'uns at home for husband to watch. The technician handed me the flimsy "first picture of baby" and I carefully placed it in my People magazine as if I was going right home to paste it in the scrapbook that I have been preparing for the precious new arrival. I have finally gotten real with my child documentation and faced the truth that there will be no more baby books beyond child 4. This is it kids. My blog is your baby book and you will even have to accept the stock image ultrasound photo that I found online because I am too lazy to walk out to the the car to get my magazine. (like you could even tell the difference.) I still love you like crazy!